English muffins are one of my favorite things. I hunted around tastespotting.com and foodgawker.com to find fellow bloggers that have already tried out some recipes. I settled on this post from Julie at My Cooking Adventure. They turned out well, and used things I had on hand. These were the simplest English muffins I could find to make, and I would make them again. However, they weren't filled with the nooks and crannies that I soooo love. I would make the English muffins up the night before you want to serve them. Otherwise you are getting up at o'dark hundred to get them around if you want to have breakfast before mid afternoon. Then you can have a late night snack as a reward for your hard work. What? You HAVE to test your stuff before you serve it! There are no specifics because this is as much or as little as you want kind of a recipe. For each serving you want, use one egg. So if you want 4 sliders, use 4 eggs. Then throw in some spinach, about a handful for every 4 servings, and a little onion. Don't limit yourself. If you have mushroom, peppers, throw them in! The more the merrier. Preheat oven to 350° degrees. In mixing bowl add eggs, and a small amount of water (makes eggs moist), whisk for a minute or so. Then stir in onion and spinach. Pour mixture into greased muffin tins, until about ¾ full. Cook in preheated oven for about 30 minutes. Use a fork to loosen egg muffins. 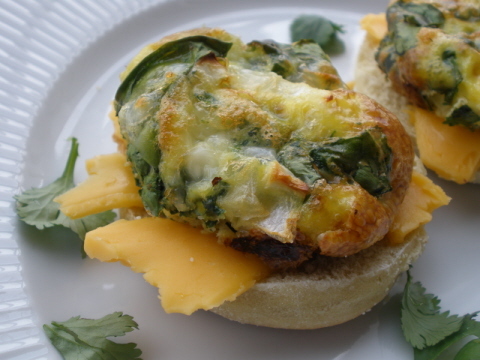 Toast the English muffins, serve with sharp cheddar and top with egg muffins.